Powerful designs and complex mechanics confirm the TNT collection's explosive character. Sculpted from steel and titanium, the TNT Chrono 43 nonetheless brings a subtle classicism to the wrist. This is the first time in the TNT collection that functions are displayed on a dial, specifically a sapphire dial whose bold hour-markers and transparent openings envelop the hands to confirm the overall force of the design. The brand's values are clearly in evidence, exemplified in the 60-minute counter, a hallmark of Pierre DeRoche, and the visible mechanism, an automatic chronograph movement by Dubois Dépraz. Mounted on a stitched rubber strap, the TNT Chrono 43 is the brand's eighth chronograph. This 201-piece limited series has already established Pierre DeRoche as a true specialist in time measurement. Mechanical automatic, exclusive Dubois Dépraz calibre, 49 jewels, decorated and engraved oscillating weight. 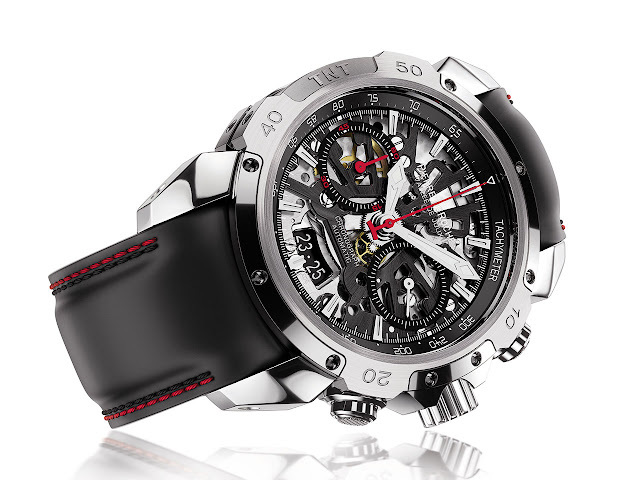 Hours, minutes, seconds, chronograph with 60-minute counter, medium-sized date. Black PVD-treated titanium middle. Bezel, lugs, crown-guard and screw-locked crown in steel, 43 mm. Sapphire crystal with anti-reflective coating on both sides and sapphire back. Water-resistant to 100 metres (10 bar/330 ft). Sapphire. Applied hour-markers with Superluminova coating. Stitched rubber with safety folding clasp.